Patricia Krenwinkel was born in Los Angeles, California to an insurance salesman father and a homemaker mother. She attended University High School and then Westchester High School, both in the Los Angeles area. She was often bullied at school by other students, suffered from low self-esteem and was frequently teased for being overweight and for an excessive growth of body hair caused by an endocrine condition. After her parents divorced, 17 year-old Krenwinkel remained in Los Angeles with her father until she graduated from Westchester High School. For a time she taught Catechism, a type of Roman Catholic religious instruction, and considered becoming a nun. She decided to attend the Jesuit college, Spring Hill College in Mobile, Alabama. Within one semester, however, she dropped out and moved back to California. Moving into her step-sister's apartment in Manhattan Beach, she found an office job as a processing clerk. may be just me, but they seem awfully dressed up for a trial. Seems that tragedy brought them back together, if only for a short time. I'm not the sharpest dresser most days... but, I'd certainly wear a suit, if I were on-trial... or, attending a courthouse on my child's behalf. As for Mrs Krenwinkel... she does look a bit overdone... like she's attending a ball. But, that was simply the style back then. Even my Mom got a white leather coat with real fur around the collar for Christmas one year, in the early 70's... and she's the most unpretentious woman in the world. My dad must have saved nickels and dimes, for 3 years... and hocked a few things, to afford that coat... because we were dirt poor. It's just what people did back then. The "big hair" was everywhere, as well. 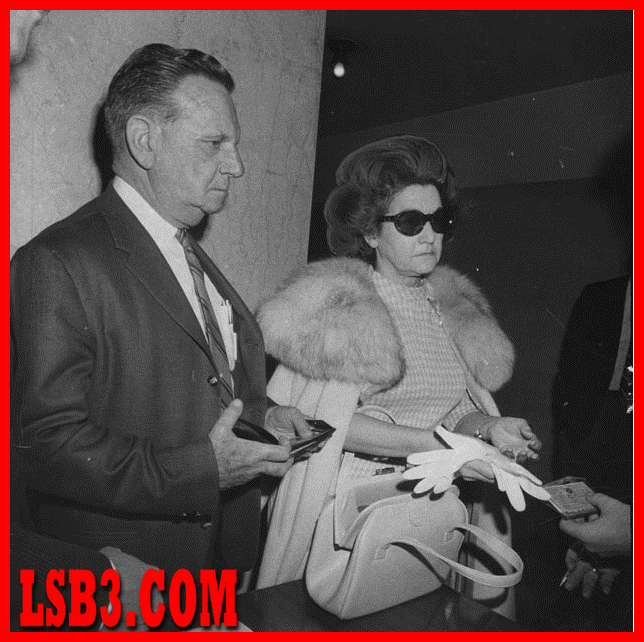 By today's standards (I agree) Mrs Krenwinkel looks totally over-the-top... but, at that time... it was the thang. Who can forget that famous photo of Joe Namath standing on the Jet's sidelines in that HUGE million dollar fur coat? You'd never see that today. I wonder why she wears sunglasses inside? I think she's probably dressed according to what women her age wore back then. A dress, white gloves and a coat with a fur collar. Did she actually say that she didn't believe that her daughter didn't do what she's accused of? Interesting when she mentions that Pat showed up at her mom's house with friends and acted like it wasn't her house, and that her mother couldn't get her alone to talk to her. I wonder what time period she's talking about. Pat's an enigma. It's hard to figure out why a girl would go from wanting to be a nun, to brutally and savagely carving up strangers. I don't really know if she knows why she did that, although she has made a statement in the past "that it could have happened to anyone". 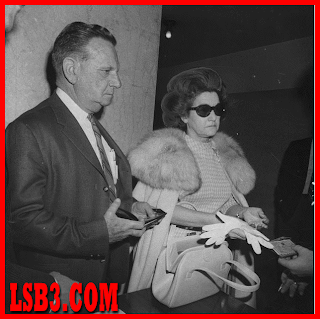 Interesting that Mr. Krenwinkel says he didn't ask her about Manson. And yes Josh, they had to reunite for their daughter's defense. I don't know if that was easy or hard. katie, my mom liked to wear sunglasses indoors. I asked her many times why she did this, but I was never able to get a reason that made any sense to me! I don't get the sunglasses thing either. Especially if she's being interviewed. The only thing I can think of is hiding red eyes or something. Is it just me, or do Pat's parents seem kinda dorkified? They don't think their daughter did this...but she said she did. They never question her about Charlie? I don't know, it seems like they're there to support her, but yet they are pushing reality away at the same time. I mean, if it was my daughter I'd be grilling her under a hot lamp. LOL. It's funny how they never questioned it when Pat just up and left her job AND her paycheck and disappeared. Likewise with Thunderbolt. She told her mother that she was never going to see her again. Did these parents just think "oh, okay...I'm off the hook for their expenses". Or...did they wonder why they dropped out of sight? I've never read that ANY of these parents tried to find them again. Pat was still using her Daddy's credit card to fund gas to Charlie to go look for his Mom back in 1967. Did he not know that, or did he just not care? I wear sunglasses inside sometimes, but I doubt that Mrs. Krenwinkle and I do it for the same reasons, then again.....who knows.....lol......did they keep in touch and keep visiting her? Leslie's dad did, right? I wonder why they would even rally to her defense. Was that a public show to defend THEMSELVES? They didn't defend her until she was charged with murder. I have to wonder about Pat. Was she the "fatted calf" to get her parents off the limelight? The reason I'm saying this is because they didn't seem to give two shits about her when she disappeared. Now that she's re-appeared and is now a murderess, they suddenly come forth. Well I only have one more thing to say about this. We didn't start the fire..as Billy Joel says. I didn't start this fire. Those fuckers did. Thanks again for directing me to the Ginny Good book. Finally finished it ! Women dressed up in those days...especially to go somewhere like court. And the father in a suit. These days, mothers, Cindy Anthony, for example, show up in court wearing sleeveless tops, capris, and sandals. And even speak half truths under oath to protect their baby killing daughter, in my humble opinion. Anyone know anything more about Pat's relationship with her mother...and as the years went on with Pat's incarceration? I've read, i think in susan's book, that Pat's father was supportive, visited often, brought gifts etc. Not much has been written or said about her mother. Thanks for the photo...interesting snapshot in time. Back in the 60's, a lot of women never went out wearing slacks or shorts, only dresses. I think in 1971 the times were slowing changing, but someone Mrs. Krenwinkel's age would probably just dress the way she was taught years ago. I agree, Cindy Anthony basically just showed up in court looking like she just got up. I guess you don't have to look good to get on the stand and lie through your teeth about computer searches to protect a lying, heartless scumbag daughter from her just deserts. HA HA. I too have only read about Pat's relationship with her father. I don't know much about her relationship with her mother. I'll have to do some research on that. The way Mrs. Krenwinkel talked, she sounded like a sweet "mom-type", having a hard time believing that Pat was involved in something like that. Clueless..... so to speak. Yeah, Mr. Krenwinkel looks really pissed off...guess I can't blame him. I'm sure that he had more pleasant things to do that day than to go testify about why his daughter went nuts. I just watched the video interview with the Krenwinkels. They couldnt have sounded any more sincere & down to earth. Interesting how Mrs. says any visits from Patricia were were never alone as if it was planned that way. I dont know but could it be oh I don't know... a cult she was in. Bobby, Pat's mom did say the visits sounded planned and she said that Pat didn't act like she felt at home...that she was just as much a guest as her friends, and that she always brought others with her instead of visiting alone. I wasn't sure what the time period was that she's talking about. Marliese, when Patricia was 17 her parents separated and her mother moved to Alabama. Pat decided to stay and live with her Dad. Also, her mother was drinking heavily at the time, which caused problems in the marriage. This might explain why Pat was closer to her Dad than her mom. Kimchi, are you closxe enough to the Mcdonalds to go get your big mac the way you want it ? extra pickles or even relish for his buddy. I have never read a book quit like that. It really was emotional and some subject matter that maybe we have seen but don't write about. I really did enjoy it and as you said it was a sad tale. Well, in a matter of months I will be, but I may take up golfing before I get there...LOL..If you get my drift..seems he likes that sport a little and hangs out there daily....ya never know! Hi Katie, KimChi, Lynyrd.....it would be interesting to find out what happened with them after all this mess played out. It would be interesting to find out what happened. I know that Pat's father was still close to her even after her conviction. She had a hard time getting away from Charlie. I think harder than the others. Maybe she was wearing sunglasses because her eyes were puffy from crying or maybe they were prescription glasses. I'd say knowing they were going to be in front of news cameras probably prompted them to wear their Sunday best.